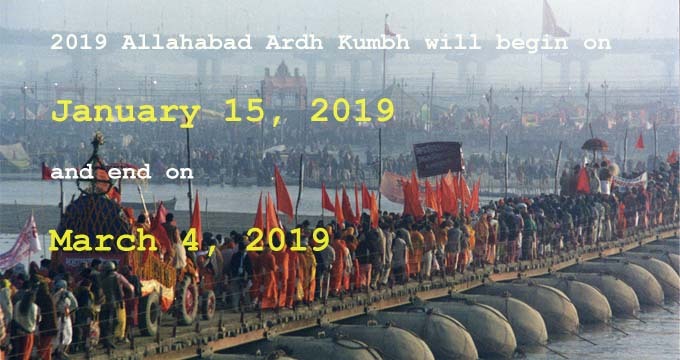 Allahabad will host the Ardh Kumbha 2019 - tour packages for Allahabad and other places of your interest in India. Allahabad is one of the four destinations in India where Kumbh Mela takes place. The Kumbha takes every three years in each of the four different locations, returning to each of four places every twelve years. The Ardh Kumbha Mela (festival) takes place six years after the Kumbh in each location. Our Allahabad Kumbha Mela tour/travel package has been designed to help you tour not only Allahabad but also other holy places around Allahabad (Prayag). Upon arrival at Delhi international airport, our representative will receive you and transfer to hotel. Overnight stay will be at the hotel. After the breakfast at the hotel we will take you for a tour of the Delhi city. Delhi comprises of two parts-Old and New Delhi, the capital of India. The city tour will cover the Raj Ghat (samadhi of Gandhiji), red Fort, Jama Masjid, Purana Qila, India Gate, President house, Qutub Minar, Humayun's tomb, Bahai temple and the Akshardham temple. After the sightseeing tour you will get back to hotel and have your diner, which follows transfer to Railway station to board the train to Varanasi. Overnight onboard the train. Upon arrival at Varanasi in morning you will transfer to hotel. After a brief rest you will have breakfast and then set out to tour Sarnath, the Buddha city. Sarnath is the place where Lord Buddha delivered his first sermon. The main tourist attractions at Sarnath are the Buddha temple, Dhamekha temple, and the Archaeological Museum. After the tour of Sarnath you will get back to the hotel and have your dinner. Overnight stay will be at the hotel. Varanasi, the holy city and the gateway to Moksha, is revered by millions of people all over the world. It is the city where life and death come together. To have a look at the eternal city, we will take you for an early morning boat ride on the River Ganges. You can spot thousands of devotees taking bath and performing rituals at the bathing Ghats (river bank) of Varanasi. After the boating tour you will get back to hotel for breakfast and then proceed for a sightseeing tour of Old Varanasi and the Banaras Hindu University. City tour also covers the Bharat Mata Mandir, Tulsi Manas Mandir and some traditional Bazaars. Overnight stay will be at the hotel. After breakfast you will head for Allahabad, the Venue of Kumbh Mela. On reaching Allahabad you will be transferred to hotel/Camp. Spend your time at leisure for rest of the day. Overnight stay will be at the hotel/camp. Early in the morning, you will take bath at the Sangam (confluence of the Rivers Ganga, Yamuna and the mythological Saraswati). It follows breakfast and then a boat ride at the holy River Ganges. Thereafter, we will take you for a walking tour of some of the sacred temples and places of Allahabad (Prayag). Overnight stay will be at hotel/Camp. Early in the morning we will take you for the Kumbh Mela main bathing. It is one of the auspicious bathing dates of Kumbh Mela, which attracts millions of saints/sages and devotees from all over to take a holy dip in the sacred River Ganga. It will follow a personal meeting with Yoga teacher (Shastri), where he will teach you some basics of Yoga. It follows rest and then dinner. After dinner you will depart for the Railway station to board the train for Delhi. Overnight on board the train to Delhi. Upon arrival at Delhi you will transfer to hotel and wash and change along with breakfast. You will have full day at leisure and you can pursue own activities/shopping. In the evening our representative will transfer you to the international airport for onward journey.